Is it possible to overdo a good thing*? Like eating too many cookies or getting too much sleep, oral hygiene is no exception. Here are 5 times when brushing your teeth isn’t such a good idea. *For the record, we think brushing your teeth is a GREAT thing. We get it — morning minutes are precious. But there’s a time and place for brushing your teeth, and the shower is not it. 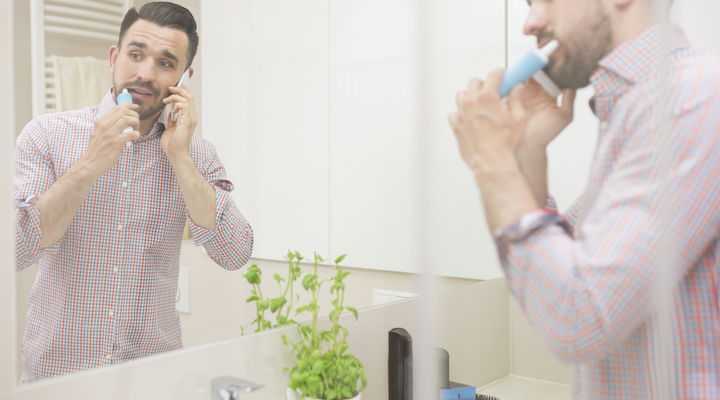 When you rush to brush, your 2-minute routine gets cut short. Plus, there are millions of microbes bathing on your showerhead. The moist and germ-filled environment exposes your mouth to all of those bathtub bacteria. Brush your teeth in front of the mirror to keep it clean. Waiting 30 minutes after you eat is more than a pool rule. You may think you’re brushing off bacteria, but you’re actually digging the acid deeper into your grin. While you’re waiting, take a swig of water to neutralize your mouth’s pH levels. As gross as it is, you have to wait! Put on an episode of your favorite DVRed show and tough it out for at least 30 minutes. Like many foods, vomit contains acid. The gastric acid in puke erodes tooth enamel. The enamel leaves teeth temporary tender, thus making them susceptible to damage. While you’re waiting and if you’re feeling up to it, eat something bland to ease that awful taste. And after you’ve slayed your sickness, remember to replace your toothbrush! Your mouth and toilet are one in the same — when it comes to germs, anyway. Both contain billions of bacteria. The toilet may be an ideal place for brushing up on the newspaper’s current events, but it’s not ideal for brushing your teeth. Brush at least 6 feet away from the toilet — bacteria can get airborne and into your mouth (gross!). Oh, and always close the lid before flushing. You can still brush with bae…just don’t share a toothbrush! We know you swap spit via smooching, but sharing a brush is different. The act of brushing boosts bacteria in your bloodstream, making immune systems more susceptible to infection. Reserve the sharing for bank accounts, desserts and laughter. Now that you know when not to brush, pay attention to when and how you’re performing the dental deed. Here’s to your smart smile!